After learning of several incendiary Facebook comments regarding Black Lives Matter demonstrators, Boston Pride has withdrawn the marshalship of Woburn Police Officer Anthony Imperioso for this year’s Pride Parade. Over the weekend, The Rainbow Times learned that Officer Imperioso had made several racialized Facebook comments regarding Black Lives Matter demonstrators who shut down a portion of Interstate 93 on January 15, 2015. “These are the very unpatriotic anti-American trash,” said Officer Imperioso in a public Facebook post. 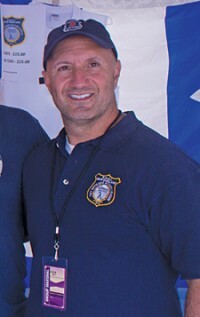 Officer Imperioso is also the President of the New England Gay Officers Action League (G.O.A.L.). According to Boston Pride’s website, the LGBTQ community nominates and ultimately chooses Pride marshals. video was posted by Steve Robinson, a producer for the Howie Carr show, a conservative talk show hosted by Boston Herald scribe Howie Carr. At nearly four minutes in length, the video features an unknown man questioning Black Lives Matter demonstrators on a bridge purportedly in East Milton Square on January 15, 2015. On that day, 29 demonstrators were arrested for blocking traffic on I-93 north of Boston in Medford and south of Boston in Milton. The demonstrators, who in some instances formed human barricades in the middle of rush-hour traffic, were protesting a recent spate of shootings by police officers of unarmed black men across the country. “Maybe we patriotic Americans should start protesting welfare offices and blocking those entrances then these lazy illiterates will go away,” said Officer Imperioso in a public Facebook post sometime after his initial post on the demonstration. “It’s a very common response, that when people protest and stand up for their rights and what they believe in and for underrepresented communities, especially when it’s against the government or the state, that people automatically want to dismiss them as agitators,” said Daunasia Yancey, the lead organizer for Black Lives Matter Boston. A petition quickly developed online last night denouncing the Boston Pride committee’s choice to allow Officer Imperioso’s nomination to stand. In less than 24 hours, Reverend Lydon’s petition had gone viral and Facebook was filled with angry comments from members of the LGBTQ community about Officer Imperioso’s marshalship. According to Reverend Lydon, more than 200 signatures were collected prior to Boston Pride’s announcement. 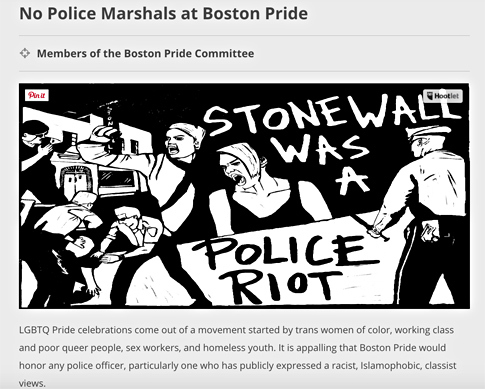 Boston Pride did not respond to The Rainbow Times request for an interview on the comments that were made on social media, its specific vetting process for marshals, and its nomination protocols. Instead, they published the release below on their website to explain the situation. “As an inclusive organization, Boston Pride does not condone any language that is intolerant of racial, ethnic, or religious differences. Additionally, we reject language that promotes violence towards any individuals who are exercising their First Amendment rights. It has come to our attention that Mr. Anthony Imperioso, who was elected a marshal by the community for the 2016 Pride Parade, has made some offensive comments on his Facebook page. Boston Pride cannot condone those comments. After a discussion between Mr. Imperioso and Boston Pride, his marshalship has been withdrawn, and Mr. Imperioso will not be a marshal in the 2016 parade. Boston Pride apologizes for the lack of vetting that occurred in the Marshal nomination process this year. Boston Pride is reviewing its marshal nomination process to ensure that it is both fair and robust to all members of the community going forward. As of 8 p.m., the New England G.O.A.L. organization’s Facebook page appears to have been deactivated as well. WOW. Did Boston just select a racist, Islamophobic police officer to marshall #BostonPride parade? 4 Comments on "Boston Pride Withdraws Marshalship After Controversial FB Comments Surface"
What is wrong with Boston pride that they don’t check their marshals before approving them? WHAT!?!?!?!!!? Wow. Shame on them and shame on Imperioso. This is the most comprehensive story about it I’ve read. I commend the writer and Rainbow Times for staying on top on unfairness. I checked around but no one really reported the disturbing and malintentioned comments this officer made at all. How could they have missed them? Shame on biased stories. I support the withdrawal of Anthony Imperioso as a Marshall for Boston Pride given his comments. That is appropriate. I have marched in Black Lives Matter protests. However, I am disappointed that the petition rejected the appropriateness of any police officer as a Marshall. That controversial comment is also inappropriate and I would have liked to have seen the Pride Committee in announcing the officer’s withdrawal affirm it was because of his comments. Since the petition played an important role in removing Imperioso, it would have been helpful to affirm that Imperioso’s comments were also an affront to other police officers, including the LGBT police officers of color, some who have been liaisons to the LGBT community that I have been honored to know over the years. It is appropriate to exercise caution in a nominations process. I empathize with the objections of disenfranchised members of our community. We’ve long permitted inappropriate inequities inside our equality movement. Nothing seems as unpalatable as a racist who claims to endeavor in the promotion of equality. However, as a fellow public servant, and uniformed brother, I must strenuously object to the assertion that an officer by nature is an inappropriate nominee. The very laws we demand to assure our equality are only as potent as the men and women who risk all to assure their efficacy. If ever their was a moment to walk a mile in someone’s shoes, we certainly must, while we acknowledge the impact to our disenfranchised communities, understand that many outstanding public servants are being painted with a very broad and very discriminatory brush.